As Britain’s leading lady show jumper, Laura Renwick has graced top international show jumping for over a decade. Together with her husband, John, Laura has successfully bred and produced a number of internationally proven horses, with many high profile wins under her belt. 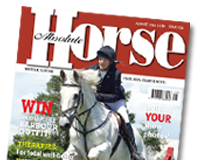 In our May edition Laura will be offering advice on jumping a double combination fence… See May edition for full article.